Everything boils down to time. Can the front-runners run out the clock? Can the under dogs meet and persuade as many voters as it takes to win?? Each hour that slips by is one hour closer to E-Day. No matter how much cash a particular candidate can rack up, the one thing they cannot do is buy more time. For a certain political party in the the lowest-voting state in the country, there for sure are not enough hours in the day. Not only are Texas Democrats saddled with the immense burden of voter turnout, they also need to stage an historic re-education campaign of Texas voters, who have long been disengaged by vigorous suppressive tactics from the TEApublican oligarchy. For even the best and brightest, this work is a mighty tall order. But it is still very possible. Some of the ingredients needed to pull off such an upset are already in place… Bright Democratic stars like Wendy Davis and Leticia Van de Putte, a GOTV apparatus larger than any ever before in Texas, and a dedicated, enthusiastic base of support. The well-informed and party faithful will be at the polls in full force this November. The last ingredient Democrats are still missing? Low turnout, low information voters. Most of the time, these voters are politically disengaged and lower-income. They are people that, by necessity, do not have the “luxury” of engaging in the day-to-day political squabbles. When you are living paycheck to paycheck, who said what in someone else’s business deal is not gonna impact your life. The big secret here folks? There is one issue that can reach the Silent Majority better than any other… Medicaid Expansion. Those same low-income, low-information voters are also the people that know the agony of being unable to see a doctor when they are sick or battling a serious ailment. After putting off a bevy of issues, they then know the fear of being forced to go to the Emergency Room from something that could’ve been prevented. They know loved ones and friends who may be around today had they had insurance. If enough of Texans know that a vote for Democrats this fall could be what gives them life-saving health insurance, there’s no question how they will vote. Stating the position on a couple of websites, though apreciated, is not enough. It’s time to put ads on the air that are crystal clear about where Democrats stand on Medicaid Expansion. Do press conferences on that single issue… Talk to families whose lives could be vastly improved with access to healthcare. Make it a major issue against the Texas GOP the same way Davis and Van de Putte have done with Education. Republicans don’t like Obamacare. We get that – and the law is not perfect. But it has been upheld by the Supreme Court and is in effect. In fact, it will be unless or until Republicans retake Congress and the presidency – which is a tall order. So every year that Republicans refuse to accept expanded Medicaid in Texas under Obamacare is another year they leave money on the table – lots of it, as in $100 billion in federal funds from 2014 to 2023. It’s time for a rational compromise. 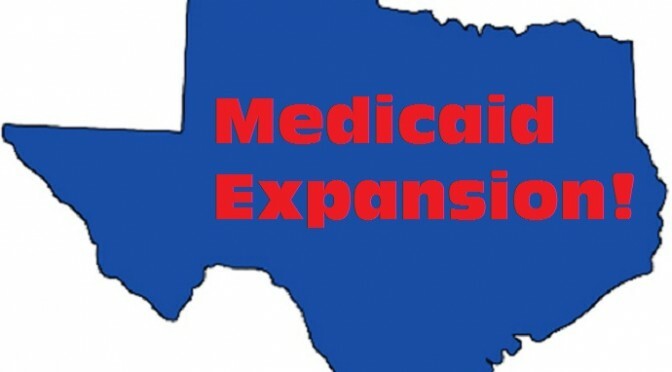 When the Legislature convenes in January, Republican members and top elected statewide officials should accept Medicaid expansion at least on a temporary basis. If Obamacare is repealed at the national level after the 2016 elections, the issue becomes moot. But as long as Obamacare remains in effect – and again, that might be a long time – Texas would be eligible for those many billions of dollars to help provide health care to low-income residents who don’t have it. This is hardly a radical idea. Republican governors in other states like New Jersey, Arizona, Ohio and Florida have done the same math and decided that the rational thing to do would be to accept Medicaid expansion whether they like Obamacare or not (and they don’t). The conversation was familiar for Ornelas, who goes door to door to talk to residents as part of efforts by the Texas Organizing Project to increase voter participation among minorities. The group’s field organizing team often meets minority voters who list health care as a top concern, and it is looking to leverage that issue to get more Hispanic voters to the polls in November. Since the Affordable Care Act passed in 2009, Republican leaders in Texas have opposed expanding Medicaid to cover poor, uninsured adults, saying the system is broken and should be overhauled before it is expanded. The issue of Medicaid expansion resonates strongly with Hispanics, who make up a large portion of the state’s uninsured population. In Harris, Dallas and Bexar counties — three of the state’s most populous counties — The Texas Organizing Project is working to use Hispanic support of affordable health care to spur a movement that could change the state’s electoral tide. The group’s leaders said they believe their efforts, which include 200 canvassers and phone bankers, will be successful because the individuals they are working with are receptive to candidates who support the federal health law regardless of political affiliation. As TOP knows, time is of the essence. The last day to register to vote is October 6th. Knowing where political leaders stand on Medicaid Expansion may be just the issue to take many people off of the fence, and over to the ballot box. While it’s important to recognize the lone Republican voices out there like Harris County Judge Ed Emmett who supports Medicaid Expansion, this is still an issue being led by Democrats, at least for the foreseeable future. The vast majority of Texas Republicans, despite mounting evidence showing that the state is running out of options, remain staunchly opposed to helping Texas families. In 2014, their only hope to have healthcare options lies with Wendy Davis, Leticia Van de Putte and their supporters. The ticking louder by the hour to E-Day. Let’s hope Texas Democrats go big on healthcare before it’s too late.